Bathroom Remodeling is an art, and very few remodeling companies in Frederick have mastered it like Unique Enterprises! 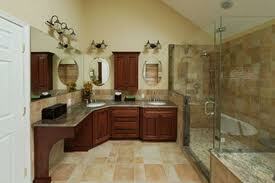 Bathroom remodeling is one of the quickest ways to increase the net worth of your home. The sky is the limit when it comes to updating or remodeling your bathroom. Whether it is a hall bath, half bath, basement bath or a master bathroom, it is a great place to show off your personality and style. At Unique Enterprises, we understand that all bathroom remodeling jobs have three things in common. The Three Rules Of Every Bathroom Remodeling Job! It MUST be performed quickly so the clients can continue with regular daily life. It MUST be done correctly, and on Budget! It MUST be planned out well to ensure that it’s done quickly, correctly and on budget! What Should You Consider When Remodeling Your Bathroom? Here is a list of items that you should consider when working on a design for your new Bathroom. As you can see, there are a lot of things to consider, and as a Licensed Contractor, it’s our goal to answer your questions, map out a plan, and to keep your project on track every step of the way. With 29 Years of experience we have the knowledge and skill to get your bathroom remodeling job done as quickly as possible, so call Unique Enterprises at 301-473-8580 and get started today!